Description: the T-Rex stands in an active posture, its head curved to the left and its arms stretched out as if attacking something. The tip of the tail is bent, pointing upwards and to the left. It has small pads on its feet to give it extra support, though it still tends to fall over at times. Its predominant colour is dark grey, which covers all of its body except for its underside (lower jaw, throat, belly, inner parts of the upper arms and legs and most of the lower part of the tail) which is coloured greenish beige instead. On the neck, back, upper legs and first half of the tail, green stripes are found, most of them forming triangular patterns, resembling lightning, or cardiographs. An additional pair of green stripes runs over the eyes (blue with black pupils) on the figure's face. The Rex's teeth are white, while the tongue and inside of the mouth are red. Its claws and the pads on the feet are not painted differently. It carries a white JP logo on each upper leg. The Velociraptor stands in a stalking posture, its right arm and leg stretched outward and its head raised upwards with its mouth open, as if it means to jump on something. The tail is raised upwards and bent at the tip. Its underside (lower jaw, throat, belly and most of the lower part of the tail) is coloured beige, while this colour also runs over the flanks, the hind parts of both arms and legs and on the face around the eyes (cat like, yellow with black pupils). The rest of the creature's body is light red, while dark red stripes run over the back and tail. The Raptor's teeth are white, while the tongue and inside of the mouth are red. The claws on the feet are painted black, though those on the hands remain unpainted. The Raptor sports a white JP logo on each upper leg. Analysis: we wanted original paint jobs, it seems we got them... Both dinosaurs look positively festive, as if they're on a night out for a prehistoric carnival. Whether that's a good thing is up for everyone to decide for themselves, but at least it's imaginative. Granted, it does feel kinda odd for two vicious carnivores like these, since it makes them stand out a lot and would hinder their attempts at seizing prey. This two-pack has a kind of Chaos Effect feel to it, weird and colourful. Maybe Hasbro went for more colour to attract the kiddies, since most collectors won't think much about these bizarre paint jobs. Plus, this is just more of the same, two sculpts that we're really tired of seeing repainted by now, getting yet another makeover, as if Hasbro is trying to find an ultimate colour and paint scheme for these sculpts (this would not be it for sure). Original colouring not withstanding, unfortunately some of the details are still off: the Rex's claws and pads should have been painted, and the same goes for the claws on the Raptor's fingers, though the latter at least got those big claws on its feet painted differently this time. Rex VS Raptor, who would win? Under normal circumstances a Velociraptor would never fight a T-Rex, but these figures are more or less the same size. Though the Raptor is more agile and has those nasty sickle shaped claws on its feet, you can't compare that to a bulldozing, bulky heavyweight like this little T-Rex, so that would be your best bet. It's a tight match though. Repaint: yes. The T-Rex originally came with the Military General for the JP III line and has already been repainted over a dozen times for Camo-Xtreme, JPD2 and JPD3 and would be used several times again for this toy line. This Raptor sculpt was paired with Alan Grant for the JP III line and has also been repainted many times for Camo-Xtreme, JPD2 and JPD3, and would also be featured in various JP 2009 sets. Overall rating: 4/10. Imaginative and funky, but rather silly new paint jobs. Otherwise there's just nothing of particular interest in this set, unless you don't own either one of these sculpts yet (if ever!). This set is not rare and can still be found with little effort. 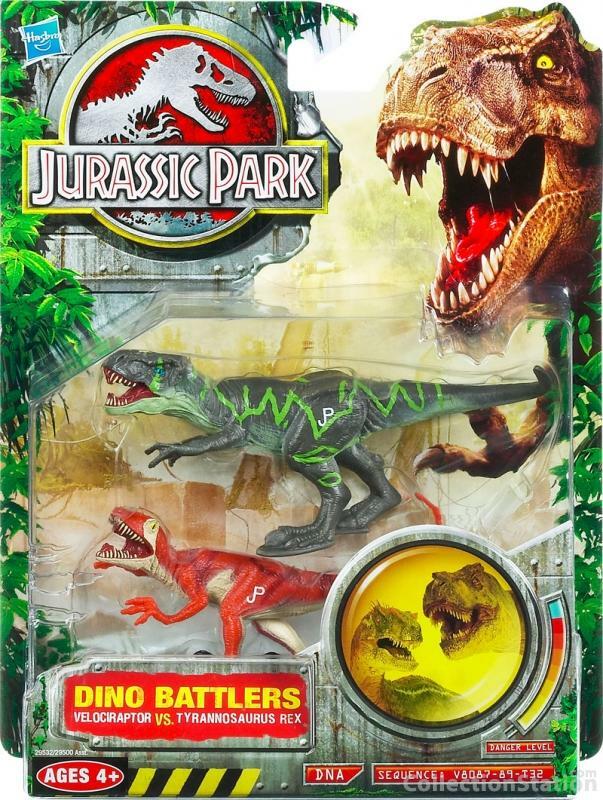 Since this set was a Toys'R'Us exclusive that could change some day, but probably not for the next decade.